Don’t get stuck in a “system”! Recently I met a horse and rider who had been struggling to find a decent canter for more than one and a half year. The rider told me her horse went hollow backed, ran too fast and for the rider the canter felt most uncomfortable and even a bit unnerving. She was desperate to find a solution. I watched them play online (on-a-line) first and then the mare’s canter appeared very nice. A good cadenced stride, a lovely canter really on both sides. Even such a nice canter that I could easily envision her in a cross country or dressage test. So I wondered what was causing the problem when ridden. In the riding session that followed later that day the root of the problem soon showed itself: rider and horse had gotten stuck in “a system”, literally. The “system” that was taught by her instructors had not put the needs of the horse first, but the system itself. In stead of building a system around the nature of this horse they had – without realising this – tried to mould the horse to the system. Techniques from the system had been used without being aware or taking notice of the needs of the horse, even though she gave very clear feed back through her body language. Looking at the mare, even before we touched the canter, I felt she told us in many ways “I cannot move this way!”. She seemed pretty desperate and although her lovely rider noticed this she had no idea how to help her other than using “the techniques” of “the system” she had been taught even more. In this case the horse was constantly asked to carry the head and neck high and she clearly could not move comfortably that way. She had no freedom to use her neck freely and that blocked her shoulders, back and hindquarters. Her body getting stuck and unbalanced also caused her to feel helpless and stressed. So this way of riding not only affected her body but also her mind and emotions. In fact, there was a quick an easy way out of this situation! First I brought the riders awareness to what her horse was trying to communicate and she immediately understood. She lowered her hands to a neutral position and immediately her horse thankfully lowered and lengthened her neck. The movement that showed up was as nice as she had been without the rider! When we came to the first canter the rider was asked to create a light seat and put her hand far forward on the neck of the horse. In this way she did not get in the way of her horse’s natural canter. Even though in the first moments this was quite exiting it was clear that the mare very soon relaxed into a beautiful canter. The next days she showed up a different horse: relaxed, soft, very supple and willing, balanced and round. It was an amazing change and it was a huge relief for both horse and rider! What is the take away is from this story? The horse should define the path of the training, not the other way around. Listening to the horse and starting from what nature offers is the key! This case made it again very clear how important it is to start from a free forward natural movement of the horse itself. Don’t try to put a horse in the strait-jacket of a system but feel and observe for what your horse has to say. The foundation should always be a biomechanic in which the horse feels comfortable, relaxed and free. 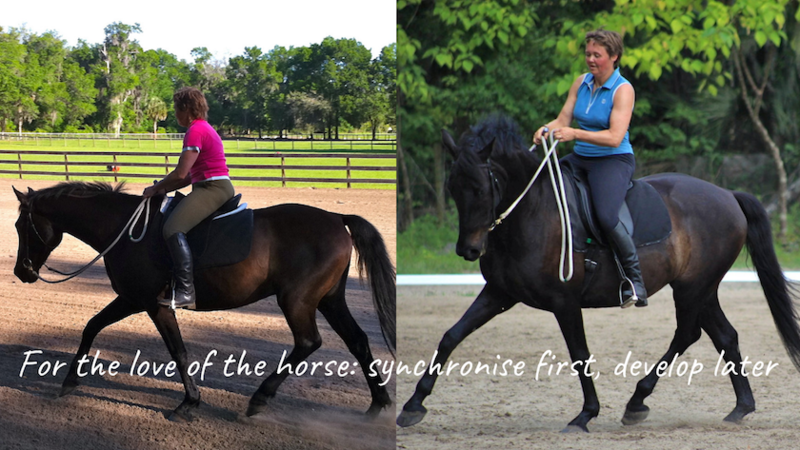 We – as riders – need to synchronise with that natural movement first. And only when we find harmony together we can start to develop or adjust the horse’s biomechanics in such a way that he can carry us in a healthy way or even will be able to perform on a high level without getting stressed or injured.